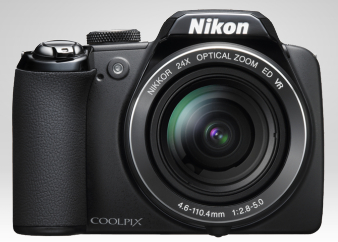 Noted the recent announcement about the soon-to-be-available Nikon COOLPIX P90. I don't normally write about cameras, but was amazed to see how technology has evolved, since I got my Canon EOS 400D, and the amount of functionality that now gets packed in. Ignoring, for a moment, the vast range of features such as the 24x zoom, 12.1 effective Megapixels and 6400 ISO capability, 1 feature that stood out was the pre-shooting cache mode. This enables you capture up to 10 frames as soon as you press the shutter release (i.e before releasing it!) - effectively taking a picture up to a second before you release the shutter. Smile Mode - the camera takes the shot when the subject smiles. Blink Warning - the camera detects that the subject blinked as the shot was taken. Enhanced Face Priority AF - technology that detects up to 12 faces and Face priority AE adjusts the brightness of the subjects face. This is not to mention the Image Stabilization and Motion detection technology that is used to minimize the effects of camera shake to produce sharper results. As the camera also provides the facility to automatically recognise and choose the best from 1 of 6 scene modes is there anything left for the user to do ? Gesture based controls are starting to change the way users interact with computer applications - as seen, for example, with the Wiimote a remote control used with the Wii games console. Wouldn't it be great if the system could detect what was happening by interpreting movement and gestures directly without the need for any input device? In order to do this, technology is required that can build up a 3-Dimensional picture of the scene or environment where the user is placed. Movement and gestures within this 3D enviroment can then be used by the system to determine what the user is trying to do. The ZCamTM is a video camera that can capture depth information (which is used to build the 3D model) along with video and is produced by 3DV Systems. The technology is based on the Time of Flight principle. In this technique, 3D depth data is generated by sending pulses of infra-red light into the scene and detecting the light reflected from the surfaces of objects in the scene. Using the time taken for a light pulse to travel to the target and back, the distance can be calculated and used to build up 3D depth information for all objects in the scene. The technology performs superior depth imaging (depth resolution of millimeters) in real-time (60 fps or more), using little or no CPU. The latest ZCamTM is based on the DeepCTM technology which is a chipset that incoporates the sensing technology. Creating an intuitive mechanism to replace the keyboard and/or mouse has been an aspiration for many people ever since Tom Cruise in 'Minority Report' looked so cool moving files around with his fingers. Perhaps this technology can be used in helping to achieve those aims. Have you always wanted the ability to upload your photos directly from your camera to your PC, or online photo-album, without having to go through the hassle of connecting the camera to your PC with the supplied USB cable or removing the memory card from the camera and inserting it into a media-card reader attached to the PC? 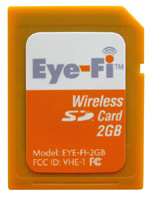 Now you can using the Eye-Fi Card. This is a wireless SD memory card which stores images like a standard SD card but can also use your home wi-fi network to upload the images directly from inside the camera to your PC or Mac. Once you install the Eye-Fi Manager on your PC and set up an account, images will upload to your hard drive and optionally to a specified photo-sharing website like Flickr or Picasa. So just go out, take your pictures and switch the camera on when you've returned home, the Eye-Fi card will automatically start uploading the images to your computer and/or your web based photo album.